While it usually indicates that I’ve been too busy to post, and therefore my blog is behind, I adore “weekends/holidays/trips in review” posts. You know, like last June or Christmas 2013 for example. Here’s a new one for me though; a month of weekends in review – March 2013 in review…and what a month it was! 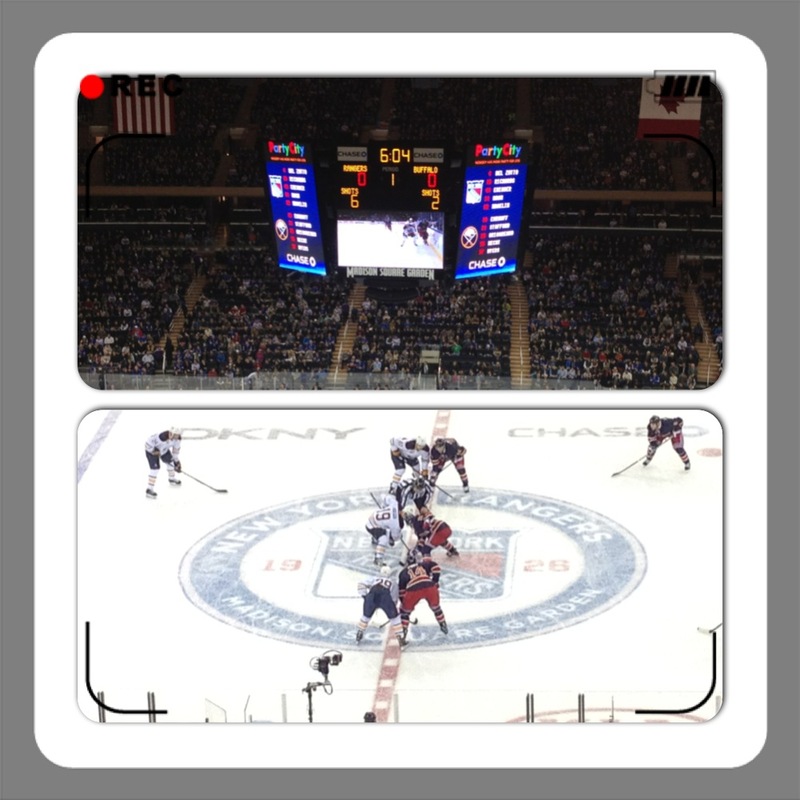 Buffalo Sabres vs. New York Rangers. For an early birthday present, the Chef got tickets to the Sabres’ March 3rd game at Madison Square Garden. When circumstances unfortunately prevented him from attending, my brother stepped in and enjoyed these amazing seats with me. As with all Buffalo sport events I attend live though, the Sabre’s lost in a shootout. 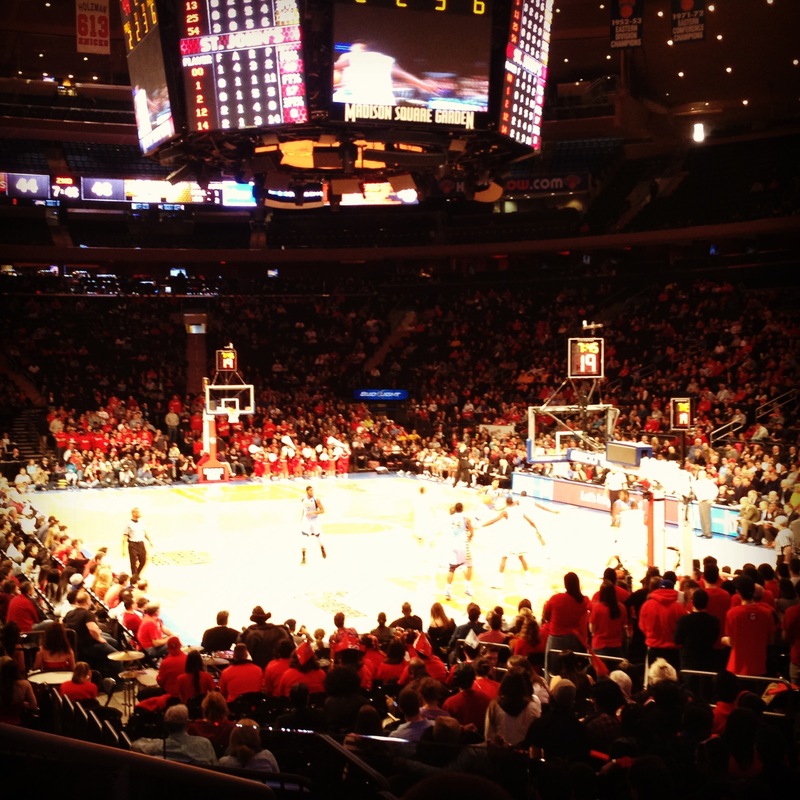 St. John’s vs. Marquette. As a St. John’s girl who married into a Marquette family, it was only appropriate for my girlfriend to arrange an outing for the group and her in-laws when the two played. I happily donned red and rooted for St. John’s while simultaneously giving death stares to anyone in my general vicinity eating a hot dog with mustard. Food poisoning. Oh wait, team food poisoning. Quickly ordering pizza and salads on a very busy Friday, we were all sick within hours. Food poisoning with friends and a completely wasted Saturday. Enough said. Sumo & Sushi. 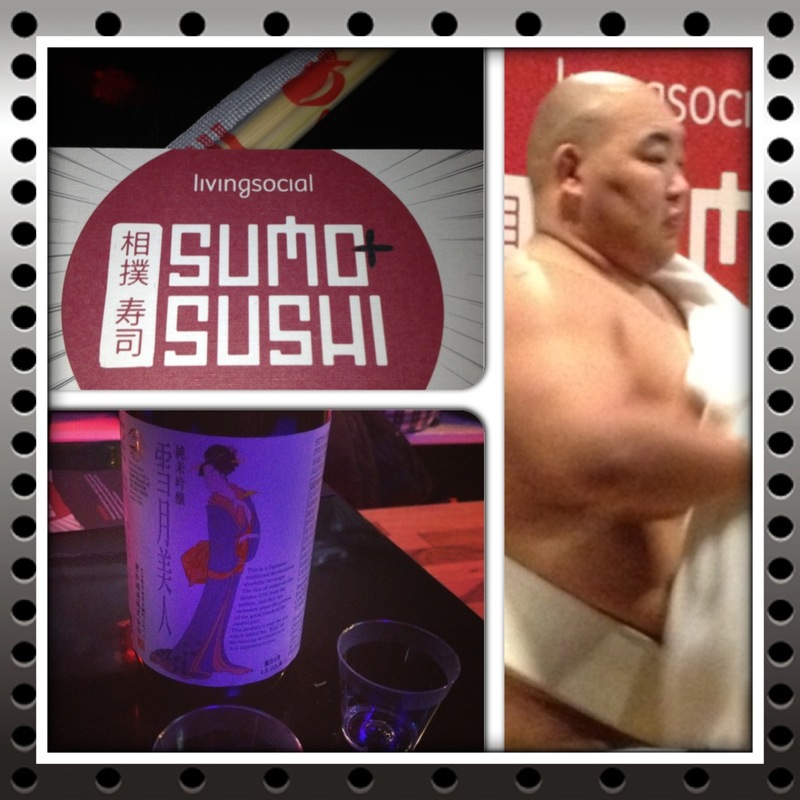 The Chef also got tickets to a sumo and sushi event, which was hosted in event space on the west side. The event brought together two of the best international sumo wrestlers, Byamba Ulambayar and Kelly Gneiting, for five matches while simultaneously educating spectators – about sumo training and diet; wrestlers’ age, weight, and career longevity; and perhaps most interestingly, the difference between Japanese (i.e. lifestyle) Sumo and International Sumo. And yes, we drank way too much sake before heading downtown to meet up with his friends. Discovering brunch at La Cava. Who would necessarily think unlimited weekend brunch at a midtown wine bar? Google. A quick search of unlimited brunch options in my ‘hood and before I knew it, we had a new favorite brunch joint. Favorite because, sure, the food is fine. Good even. But the draw of La Cava on a Sunday is the super friendly waiter who loves to chit chat and the unlimited champagne and/or vodka drinks, which are poured heavily and never seem to end. The first time we had brunch here, I barely remember hitting the bed before passing out for a champagne-induced nap. Playing with toys at FAO Schwartz. After our most recent soiree at La Cava, and after a particularly stressful couple of weeks, the Chef and I made our way to FAO Schwartz to, well, relax and play with toys. Between playing with Fraggle muppets, watching tourists on the piano made famous in Big, and picking out a Lego set and matchbox car for a friend, we (of course) played a game. 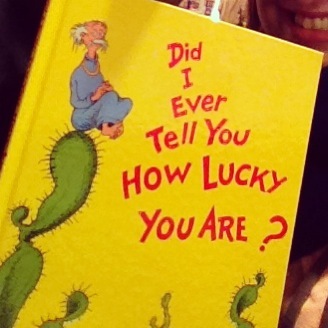 Name of the game is pick out the book that best describes the other person. Go figure. We picked the same title, ha. Birthday weekend. Need I say more? I’m still recovering. NYC Craft Beer Festival at the 69th Regiment Armory on Lexington. On the last Saturday of this action-packed month, I grabbed a 2 oz tasting glass and indulged in unlimited tastings of 150 craft beers from all over the country with the Chef and his friends. Sushi afterwards definitely made sense; especially at a Japanese restaurant that serves unlimited white wine and sake. I mean, it’s not like we had to be at his parents’ house at 9 am the next morning or anything. Oh, wait…. A new and unique Easter celebration. Before heading to the Javits Center for the New York International Auto Show (a Chef family tradition), we had breakfast (my contribution was mimosas, obviously) and threw a football around the backyard (to which his father teased “You throw like a girl!”) At the car show it was determined that I need to live on an island and drive a Mini Cooper Roadster. Because, well, why not?